Get the Power of Minecraft maps with this simple and useful mod. Cartographer 1.6.2 and 1.6.4 is a mod that allows us to expand a map when placing it inside a frame. It’ll be useful when you put several followed maps one after other on the walls, so that they will assemble so, instead of having a wall with 3×3 of frames with maps, you’ll have a map expanded all over the wall. In the picture above we can see that would place our maps, without this mod. While in the next picture we can see how it would be with this mod installed. How to install Cartographer Mod for Minecraft 1.6.2 and 1.6.4? 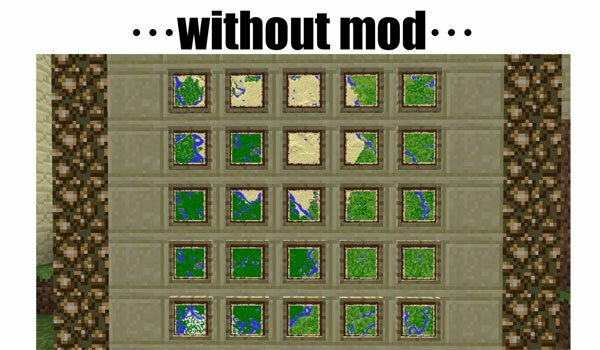 Paste the mod downloaded file into .minecraft/mods. Maps expandable and useful for real! does this work for servers or is it client based?